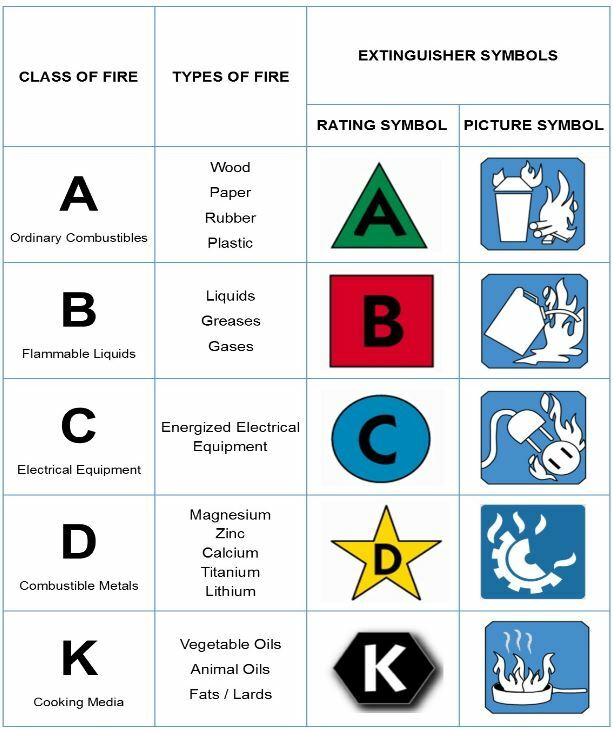 For automotive uses, we are generally concerned with Class A, B and C fires. Without a doubt, the cheapest fire extinguisher type is dry powder. These fire extinguishers use mono-ammonium phosphate, sodium bicarbonate or potassium bicarbonate (Purple K). Apart from making a mess, the problem with them is that they are extremely corrosive, both to exposed metal and electrical. Once deployed, dry powder has significant capacity by weight to extinguish fires, but it shouldn’t be used in applications where you care to repair/retain the car. The great thing about CO2 is that it does not leave a residue, and not only does the CO2 deprive the fire of oxygen, but it also cools the area being sprayed. 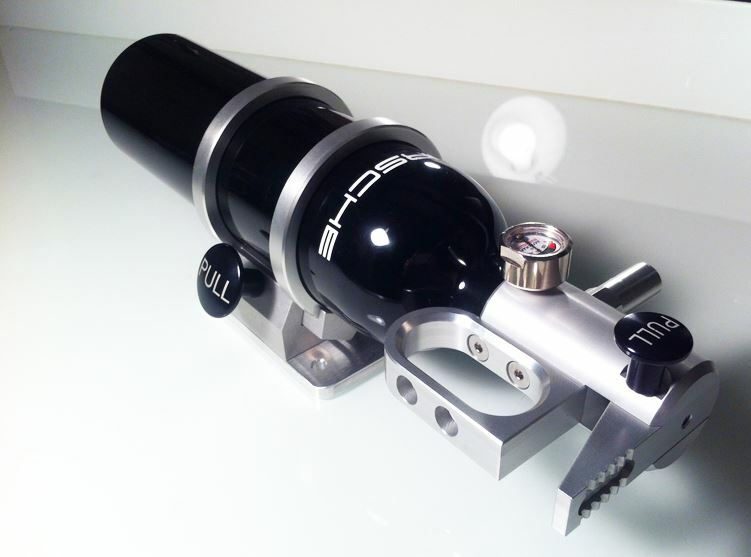 There are two main problems with using CO2 in automotive applications. First, capacity is an issue; a 5lb dry powder fire extinguisher has 4 times the fire fighting efficiency over a CO2 extinguisher. What that means is you would need 20lb of CO2 for the equivalent of 5lb of dry powder. Second, CO2 is only only rated for B and C class fires, not A. This is important because many components within a vehicle fall under the A class. The reason CO2 doesn’t get an A rating isn’t because it can’t stop fires on those substrates; it is because the mechanism in which it operates (displacing oxygen), only works momentarily, and therefore as soon as the carbon dioxide is gone, the fire is likely to reignite. They are mostly made in Italy and go by the names of Element, Fire Stryker and Gima (Italy). 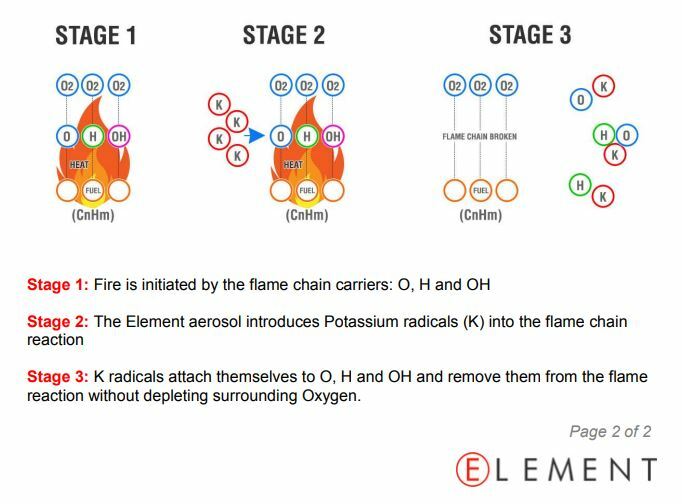 These work primarily by interrupting the combustion process of the fire, wherein potassium nitrate burns much like a road flare to create a plum of smoke where the byproduct releases potassium radicals to break the fire chain. They are generally advertised as no residue, non toxic, and maintenance free. These types of extinguishers have two debatable disadvantages. First, Potassium nitrate and its combustible derivatives are generally not considered safe for breathing. Second, the flare like action will leave some residue on metal and electrical parts, and will cause corrosion. Potassium nitrate is an oxidizer and therefore will rapidly increase the rate of oxidation (rusting) of metal and electrical components. Assuming the potassium nitrate is fully and wholly contained during burning, the potassium salts (a mix of sodium and potassium chlorides) are also very corrosive. To what extent these salts will stick and remain on parts is debatable. Third, depending on the fire type, there may be a lack of sufficient pressure to put out a fire relative to some other systems. Two massive advantage to these are run time and shelf life. These types of extinguishers run substantially longer (25 seconds, 50 seconds and 100 seconds), and therefore where pressure is not needed, or inexperience exists, the additional fire fighting time can make the difference. This is where we go into the world of what are called clean agent fire extinguisher, and the price tag comes with it. Clean agent fire extinguishers are specifically designed to not damage the underlying component post fire, they are designed to not leave a residue, and cause no corrosion. 3M claims their Novec 1230 (which you will learn about below) is used in server rooms, hospitals, and museums. These types of extinguishers are generally much more effective than CO2 as they don’t just displace oxygen, but rather break the chain within the fires combustion cycle. Historically until 1995, when it was banned from further production, Halon 1211 and Halon 1301 where the primary clean agent fire extinguisher compounds. They were primarily the only fire extinguisher type permitted in use for aviation or near airports. The reason for this is that using any other kind of fire extinguisher type near other planes can lead to contamination, and subsequently corrosion to the aluminum air frames. Halon is still available for purchase in some countries by way of reclaimed Halon, however no new production is permitted. The primary reason for discontinuation is that Halon is a CFC that causes tremendous damage to the Ozone. In the 80’s OEM BMW fire extinguishers were Halon 1211; however since the mid 90’s after the Halon ban, are now dry powder based (read: corrosive). 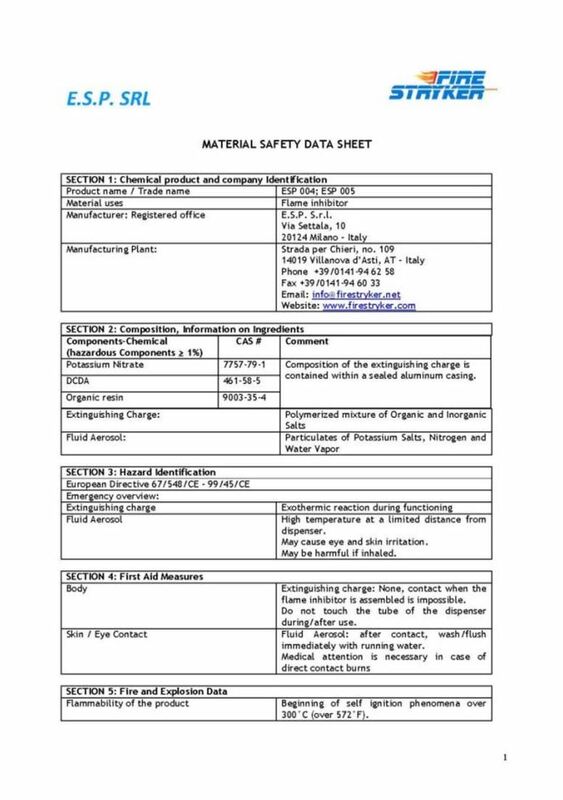 Generally only Halotron 1, FE-36 and FC-5-1-14 (3M Novec 1230) are considered acceptable portable alternatives to Halon. Novec 1230 being slightly different than the two before it because it is a fluoroketone instead of a traditional HFC. Which to the laymen, means that it pollutes even less then HFCs and unlike HFC replacements like Halotron wont be banned by 2025+. Fluoroketone based systems require higher pressures, and cost more for less density. However, because of the additional cost, these systems are generally better built. Being the youngest invention; to date I am only aware of Safecraft having bottled Novec 1230 into a small portable extinguisher unit. Halotron 1 has been widely available by most extinguisher companies for 15-20 years, as it was one of the first Halon replacements. Personally, I have chosen to go with a Safecraft PB3, because their extinguishers are finely crafted, and built to be in abusive situations (offroad); my hope is that the extra level of effort required to make the extinguisher means that it won’t have lost pressure if I ever need it. As a bonus, given time I will be able to refill/service it with a substance that shouldn’t be banned in the medium to long term. As a backup I have also purchased a Element stick, as it requires no service with an indefinite shelf life, which given a worst case scenario of the PB3 having no pressure will be better than nothing. Given a more modest budget, I would have purchased a Halotron Extinguisher. This entry was posted on February 3, 2019 at 1:16 pm and is filed under Interesting Stuff. You can follow any responses to this entry through the RSS 2.0 feed.